SAN FRANCISCO (Aug. 14, 2017) — City Attorney Dennis Herrera announced today that he had filed a second lawsuit against President Donald Trump’s administration, this time over the U.S. Department of Justice instituting unconstitutional new conditions on federal law enforcement grants. 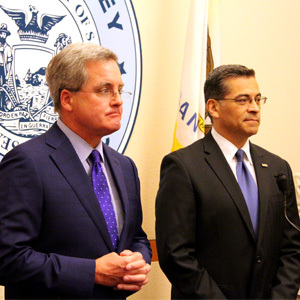 San Francisco’s lawsuit filed Friday in U.S. District Court for the Northern District of California is part of a coordinated effort with California Attorney General Xavier Becerra who will file a similar lawsuit today on behalf of the state. San Francisco’s lawsuit was filed against U.S. Attorney General Jefferson B. Sessions III, Acting Assistant Attorney General Alan R. Hanson and the U.S. Department of Justice. It seeks a court order declaring Sessions’ new grant conditions unconstitutional and void. By imposing these new conditions on law enforcement grants awarded to state and local governments, the executive branch is unilaterally giving itself power that belongs to Congress, violating the Constitution’s separation of powers. It is also imposing conditions that even Congress lacks the power to impose, violating the Constitution’s spending clause. The lawsuit notes, for instance, that one of the new grant conditions, which in practice would require detaining people past their release date, violates 4th Amendment protections against being jailed without probable cause. The Department of Justice announced in a July 25 press release that it was adding new conditions to be eligible for Fiscal Year 2017 Edward Byrne Memorial Justice Assistance Grants. These grants have been awarded annually for more than three decades. The department describes them as “the leading source of federal justice funding to state and local jurisdictions.” In Fiscal Year 2016 the program provided $263.9 million in grants nationwide for programs ranging from a domestic violence shelter to police vehicles. upon request, provide 48 hours notice to immigration agents before releasing someone that the federal government suspects — often wrongly — is in the country unlawfully. That means residents and U.S. citizens could be jailed without probable cause, and cities or states could face legal liability for holding someone past their release date to provide the federal government the required notice. There is no federal law that requires local jurisdictions to provide advance notice to federal immigration authorities before releasing someone purportedly in the country unlawfully from their custody. Nor is there any federal law requiring local authorities to grant federal officials access to local detention facilities to interrogate people in custody. The new grant conditions are part of the Trump administration’s continued misguided assault on sanctuary cities. These jurisdictions limit their coordination with federal immigration officials and use their law enforcement resources to fight crime rather than perform federal immigration enforcement, which often involves jailing individuals who have not committed a crime and have only committed civil violations, like overstaying a visa. Not only does research show that immigrants are less likely to commit crimes than native residents, a UC San Diego researcher found that sanctuary jurisdictions have lower crime and less poverty. More than 600 cities, counties and states have some type of sanctuary policy, according to the Immigrant Legal Resource Center. California faces the prospect of losing $28.3 million in Byrne JAG funds in fiscal 2017, with San Francisco potentially losing $1.4 million. The money is slated for programs spanning seven city departments, including the Police Department, Sheriff’s Department, District Attorney’s Office and Public Defender’s Office. The grant would fund initiatives designed to reduce recidivism, deter drug use, provide services to at-risk youth, and supervise probationers with substance abuse and/or mental health issues. One program is Young Adult Court, where 18 to 24 year olds accused of certain crimes are put on a structured path to productivity. They are required to check in weekly with the court as they pursue therapy, life-skills classes and employment. If they successfully complete the program, they can have their charges dropped or reduced. The new grant conditions represent a different way to try to cut off certain funding to localities with sanctuary laws.